Green World Group (GWG) is the most favored Safety Training destination for students who are planning to join health and safety courses and pursue successful career in occupational safety and health. Having branches all across India and abroad, GWG in New Delhi has been offering world-class and internationally accredited safety courses such as NEBOSH IDip, NEBOSH IGC, NEBOSH PSM, NEBOSH HSW, IOSH MS, IRCA Approved ISO 45001:2018 Lead Auditor Course, International UK Safety courses approved by CPD & RoSPA and Various Industry Specific Government approved National Diploma courses. What is Nebosh IGC course ? NEBOSH is a UK-based popular educational advisory board which conducts quality safety training through its accredited advanced centres spread across several nations. NEBOSH Qualification can evolve students and working professionals to comprehensive HSE professionals who can be hired by industries to address workers’ safety concerns. NEBOSH certification is the most accepted and respected safety qualification by employers around the world. Why take the NEBOSH IGC ? NEBOSH International General Certificate (IGC) is the most popular HSE training among students and industries. With NEBOSH IGC, students can look for employment as safety officers, get eligible for higher safety qualifications and apply for professional memberships from prestigious boards and institutions such as IOSH & IIRSM. 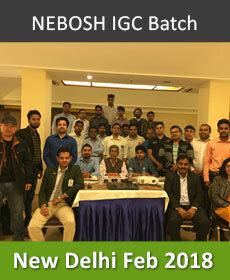 Why NEBOSH at GWG institute? Green World Group is the NEBOSH-certified training institute at lowest course fees than any other institute in India and having branches across several cities and nations. 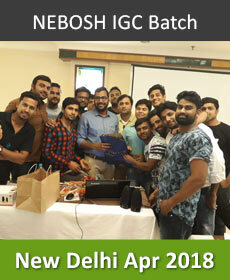 Being the top ranking NEBOSH institute in Delhi, we do have the credit of high pass out percentage for the highly competitive NEBOSH IGC exams. GWG has surpassed 800 NEBOSH Batches, showing its expertise in Training NEBOSH. NEBOSH training under the tutelage of expert professionals from GWG, train students and working professionals to clear the most challenging NEBOSH exams and make them thorough HSE professionals. Our World Class Training Facility & FREE Online tool kit & expert tutor support Guides candidate to prepare for the NEBOSH Exam effectively. Who is a health and safety officer ? And why safety officer is important? Workers belong to various industrial units, offices and other commercial establishments in Delhi face different kinds of potential dangers, health risks and unfriendly atmosphere which can lead to accidents, injuries, illness, absenteeism and productive loss. To avoid all these, employers take the help of HSE managers, health and safety analysts and workplace officers to ensure incident-free and healthy work environment for all. Since ensuring safety is the prime concern for all employers, the demand for good and quality workplace safety professionals is always high. As every workplace has its own way of handling risks and dangers, the demand for safety officers is highly specific and hence employers require multi-faceted HSE professionals who can handle any kind of risk under different working conditions. Green World Group is the leading institute on occupational safety and health aiming to provide quality safety professionals to industries across the world so as to curtail workplace-related accidents, injuries, fatalities and losses. For the students and workers in Delhi, safety officer courses are offered to meet the individual career ambition coupled with qualification, aspiration and job prospects. We offer several internationally recognized safety courses in New Delhi along with many indigenously made diploma courses.